Mubarak Steps Back, But Not Down Egypt's president says he'll give more authority to his vice president but reiterates that he'll stay in office until September. 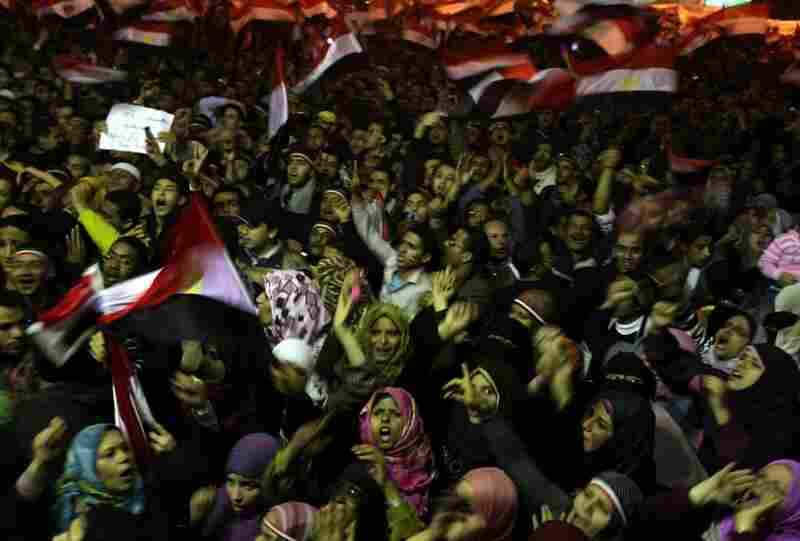 After a day of reports that he'd step down, protesters in Cairo's Tahrir Square responded by chanting "Get out! Get out!" and some waved their shoes in the air — a sign of contempt. Earlier in the day, an Egyptian general told protesters all their demands would be met. Protesters react in Cairo's Tahrir Square after Egyptian President Hosni Mubarak addressed the nation on Thursday, Feb. 10. After rumors that he would step down, Mubarak said he had given some powers to his vice president but would not resign. Tens of thousands of Egyptian anti-government protesters crowd in Tahrir Square on Thursday in anticipation of Mubarak's address to the nation. Mubarak speaks on Egyptian state television Thursday. Despite weeks of protests demanding his resignation, he said he would pass some authority on to Vice President Omar Suleiman, but would stay in office until September. 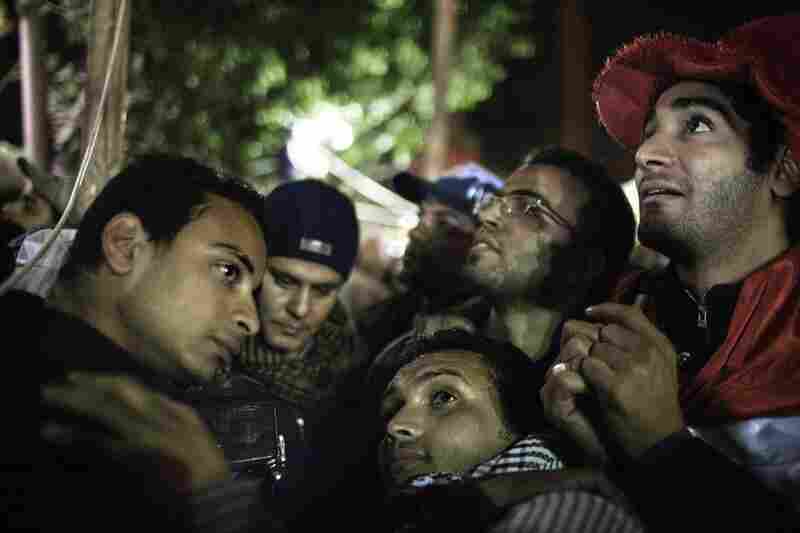 Egyptian anti-government demonstrators in Tahrir Square listen to a speech by President Hosni Mubarak. An anti-goverment protester holds the Egyptian national flag as he shouts slogans against president Hosni Mubarak in Tahrir Square on Thursday, Feb. 10, the 17th day of protests. 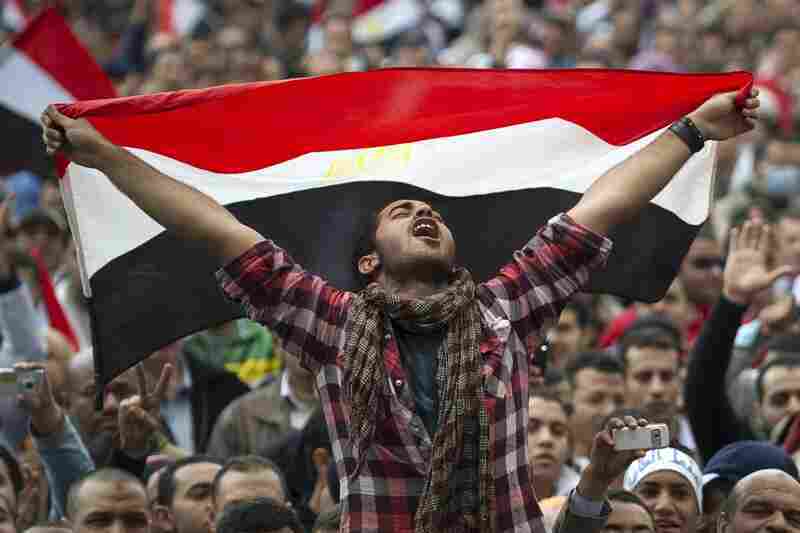 Crowds jam into Tahrir Square on Thursday afternoon after rumors swept the country that Mubarak would step down. Instead, he transferred some authority to his vice president. 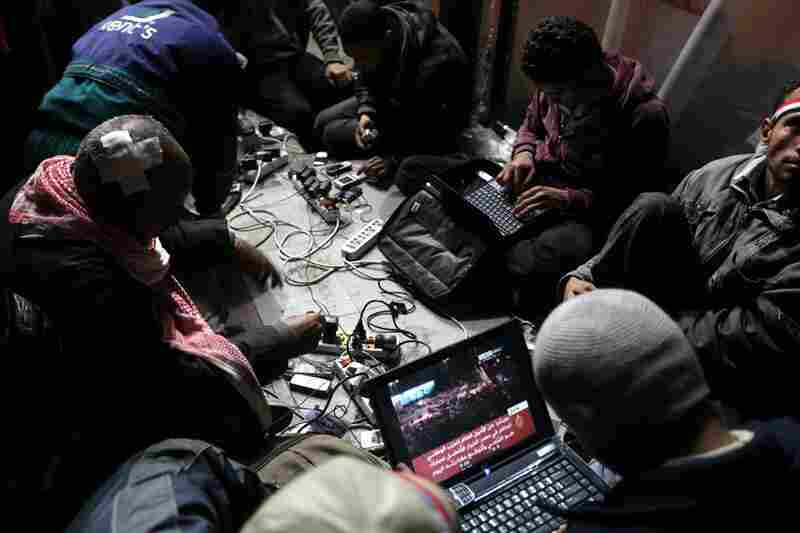 Egyptian anti-government bloggers work from their laptops in Tahrir Square. 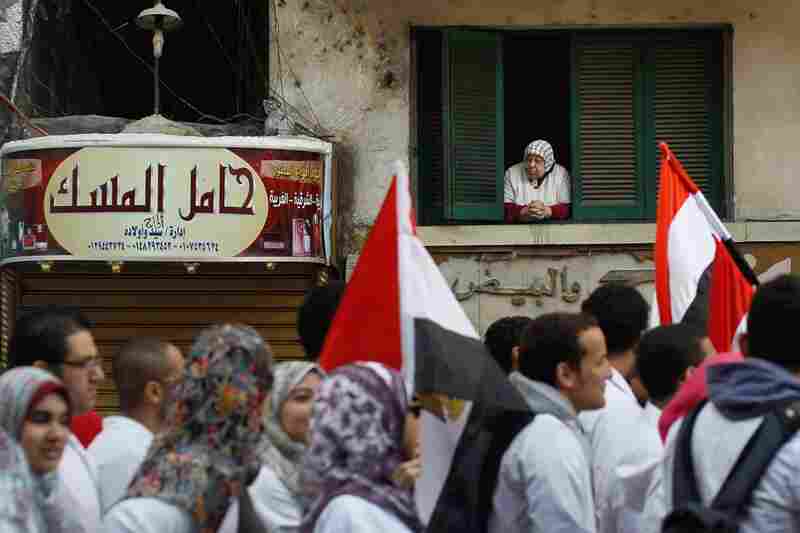 A woman looks out her window as medical school students and professors march by in Cairo. 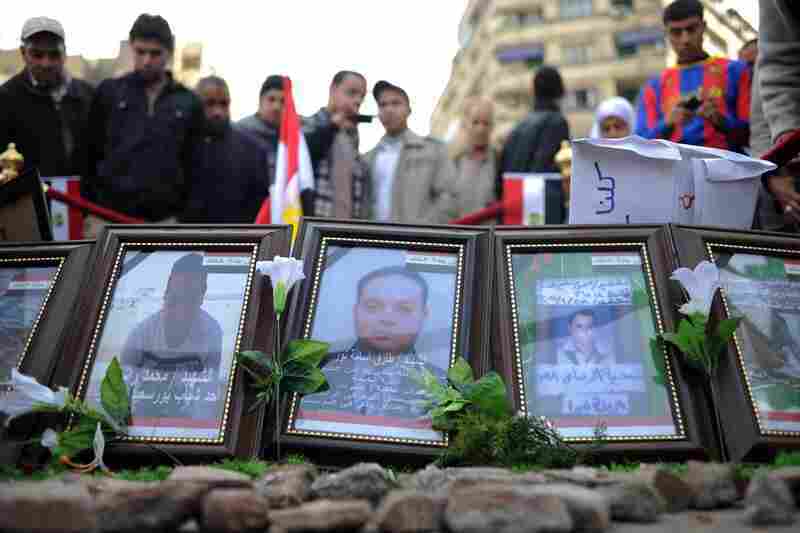 Egyptians visit a makeshift memorial for anti-government protesters killed during clashes with police and pro-government forces at Tahrir Square. Demonstrators wave a version of the national flag bearing the date Jan. 25 — the day the protests began. 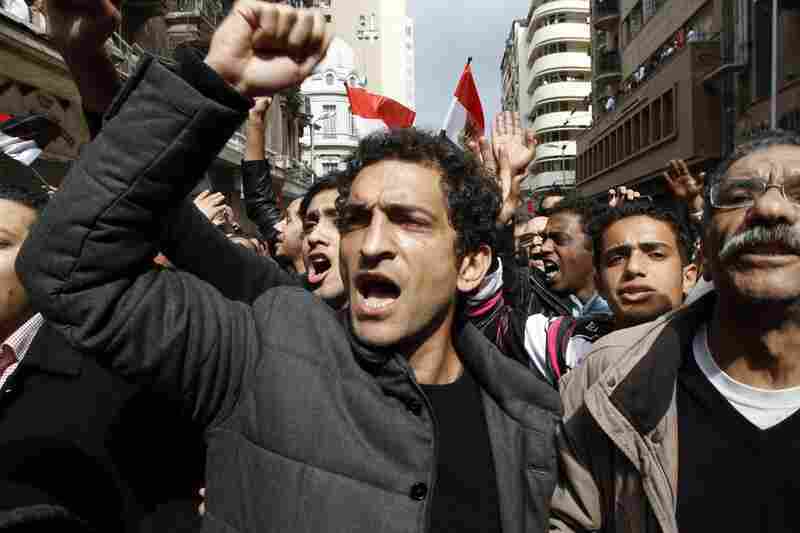 Egyptian actor Amr Waked shouts with anti-government demonstrators in Tahrir Square. 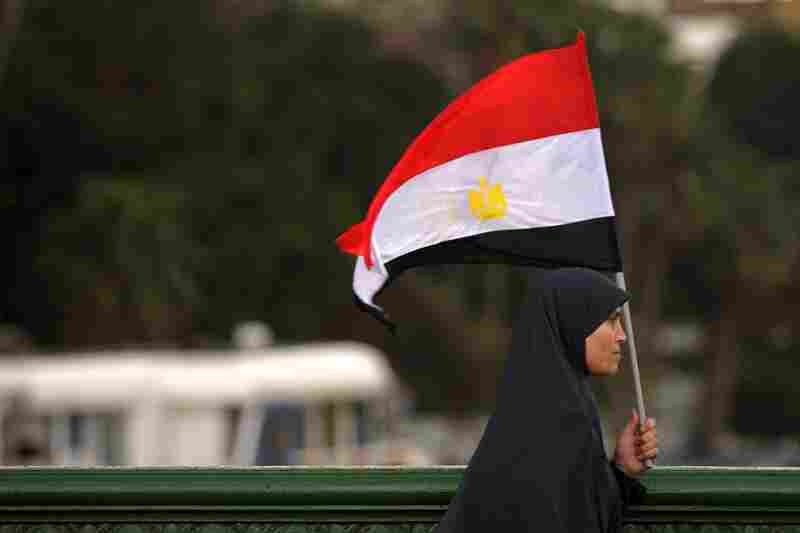 A woman holds the national flag as she walks across a bridge leading to Tahrir Square. In the midst of a traffic jam, a Cairo street vendor sells flags. 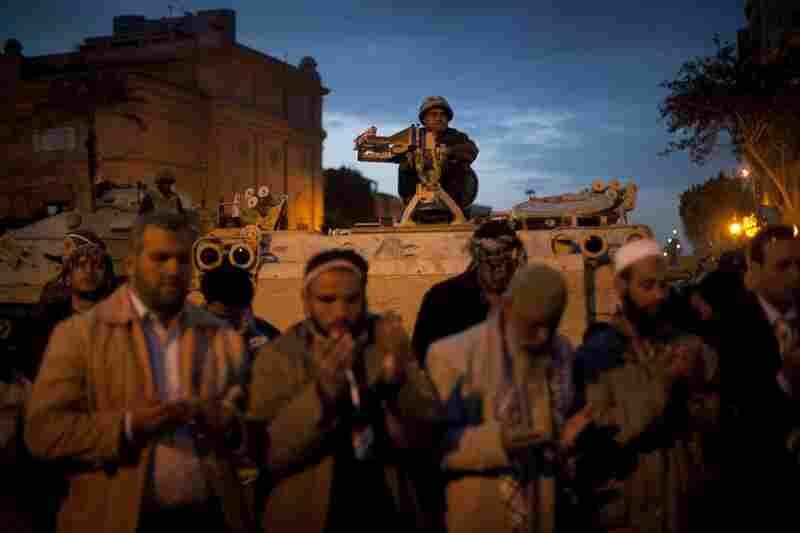 Government soldiers watch protesters pray in Tahrir Square as night falls in Cairo. Egyptian President Hosni Mubarak said Thursday that he had delegated authority to his vice president. But he reiterated that he will stay in office until September, leaving his own role in the government unclear. 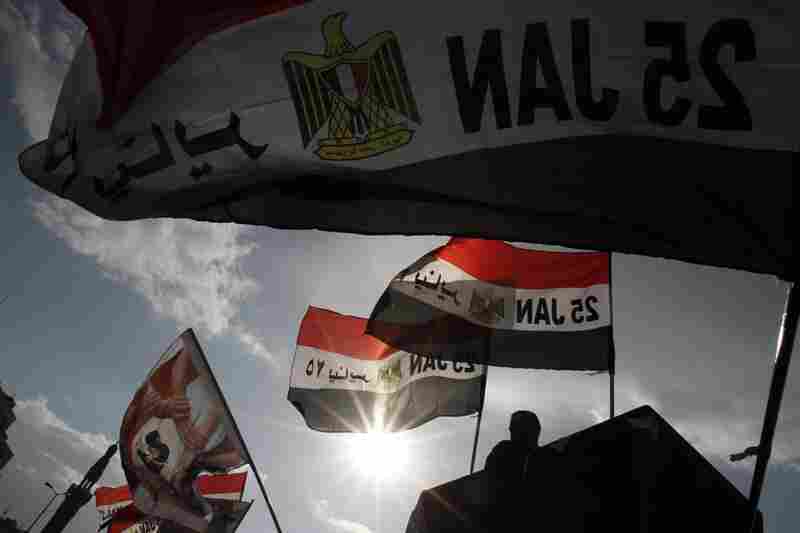 In Cairo, thousands of anti-government demonstrators immediately broke into angry chants of "Get out! Get out!" In Washington, President Obama sharply questioned whether Mubarak's statement was an "immediate, meaningful or sufficient" sign of reform for a country in upheaval. Mubarak addressed Egyptians as "sons and daughters," calling the demonstrators' demand for change "just and legitimate." But even as he said he was transferring authority to Vice President Omar Suleiman, the president spoke with a tone that was as defiant as it was conciliatory. "I have to respond to your calls," he said on state TV. "But I am also embarrassed and I will not listen to any foreign interventions or dictations, regardless of their sources. 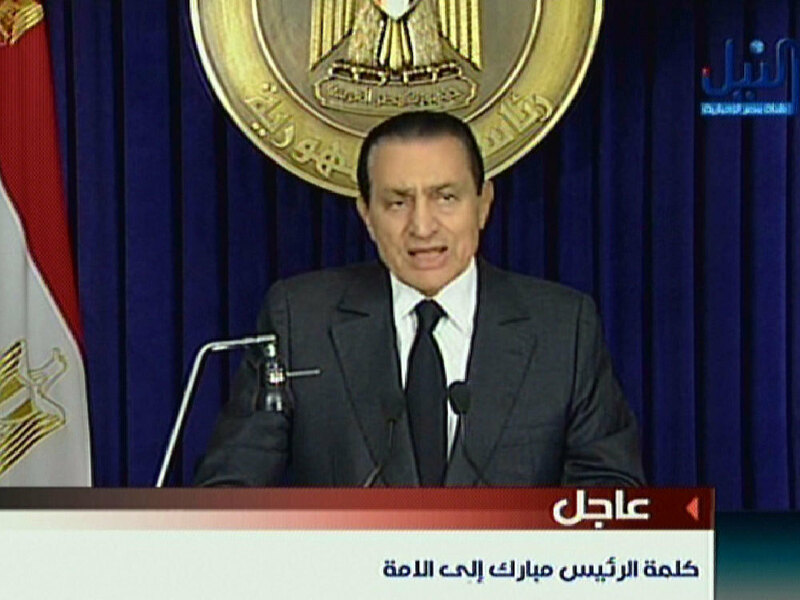 "I have seen that it is required to delegate the powers and authorities of the president to the vice president as dictated in the constitution," Mubarak said near the end of a 15-minute address. He conceded that "mistakes are apparent in any political system in any party, but what's important is owning up to our mistakes and fixing our mistakes and holding responsible those who need to be held responsible." Shortly after Mubarak's speech, Suleiman, appearing on state TV, called on the nation to "join hands and march forward." He criticized foreign TV networks for fomenting the unrest. "Do not listen to satellite television stations, whose main goal is to fuel sedition," he said. "Instead, listen to your own conscience." Sameh Shoukry, Egypt's ambassador to Washington, said Mubarak had transferred all power to Suleiman. "He has declared very categorically ... that he is transferring the authorities of the office of the president to Vice President Suleiman," Shoukry told NPR's Melissa Block. "That constitutes all authorities that are accorded to the president under the constitution [that] are now effectively in the hands of Vice President Suleiman." He said Suleiman is prevented by the constitution from making recommendations to amend the document, dissolving parliament and firing the Cabinet. 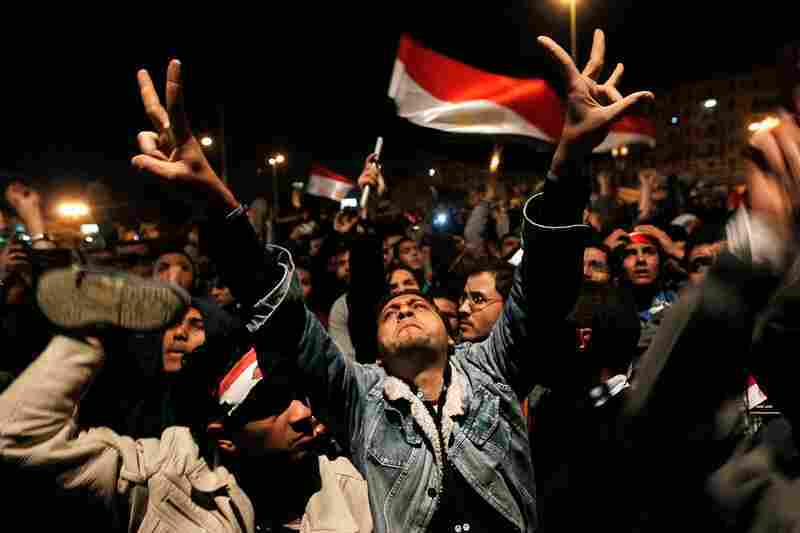 The president's speech infuriated the crowd gathered in Tahrir, or Liberation, Square. Protesters responded with chants of anger and disappointment, calling the man who has ruled Egypt for 30 years "illegitimate." Before the speech was even over, anger and confusion swept through the crowd. One of those protesters, Karim Kandil, told Block that the crowd was angry that Mubarak had no intention of leaving office immediately. Asked what the demonstrators might do now, he said, "Well, there have been some calls to head out to the presidential palace. 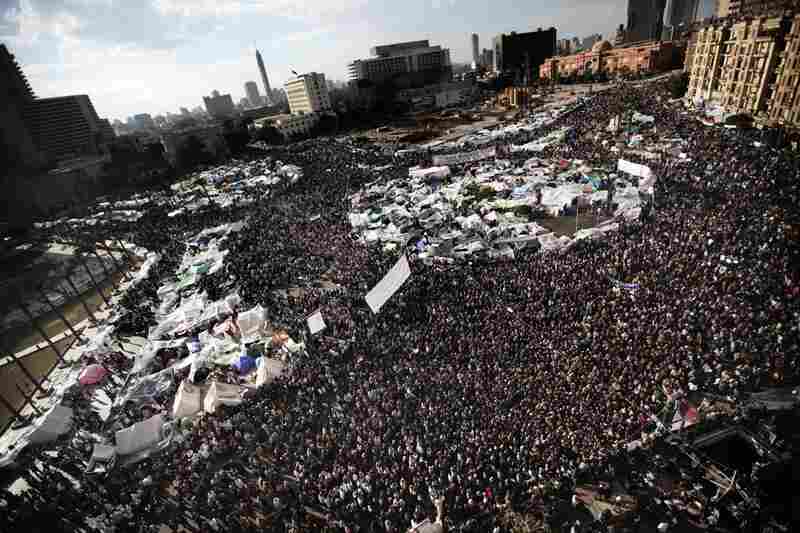 However, there have been other calls to calm people down, and have them stand their ground here at Tahrir Square. This is our ground, and we're going to stand it." Kandil said protests will continue in Cairo and across Egypt on Friday "to demand that Mubarak should step down once and for all, and have him tried for the crimes that he has committed." NPR correspondent Eric Westervelt, reporting from in the square, said some people began throwing shoes. Others left, saying they would be back Friday for more demonstrations. Nobel laureate Mohamed ElBaradei, who's emerged as a leader of the opposition, sent a chilling tweet Thursday night, writing "Egypt will explode. Army must save the country now." Before the speech, the military said on state TV that it had stepped in to "safeguard the country" after weeks of chaos and instability sparked by the nationwide protests. Army Gen. Hassan al-Roueini, military commander for the Cairo area, told the crowd at Tahrir Square during the afternoon that "all your demands" would be met. Within hours of the general's remarks, throngs of protesters expecting Mubarak's ouster streamed into the square. But the jubilation for some was tempered by fears that the country could be simply swapping one authoritarian regime for another and that it was too early to declare victory. "I am not optimistic," said Ahmed Abdel-Hamid, one of the young protesters. "I am afraid that people will feel triumph and leave the square, while in fact we have handed power from Mubarak to the army into a military abyss." After the speech, analysts expressed concern, too. "I'm really afraid that things are going to turn much uglier now in Egypt," said Michele Dunne, of the Working Group on Egypt and the Carnegie Endowment for International Peace. Dunne told NPR's Ari Shapiro that demonstrations might escalate. And she's worried that if protesters march on Mubarak's presidential residence, the Egyptian army would be under a great deal of pressure to respond. "I think actually having Mubarak come and speak today was worse than not having him speak at all," she said. Mixed Signals In the U.S. In a Thursday night statement, President Obama said it "is not yet clear that this transition is immediate, meaningful or sufficient." "We therefore urge the Egyptian government to move swiftly to explain the changes that have been made, and to spell out in clear and unambiguous language the step by step process that will lead to democracy and the representative government that the Egyptian people seek," he said. Before Mubarak's address, Obama told students at Northern Michigan University that the U.S. stands ready "to support an orderly and genuine transition to democracy" in Egypt. "What is absolutely clear is we are witnessing history unfold," he said. "It's a moment of transformation." Earlier Thursday, CIA Director Leon Panetta appeared on Capitol Hill before the House Intelligence Committee, where he was asked about reports that Mubarak would relinquish power. "I got the same information you did, that there is a strong likelihood that Mubarak will step down this evening, which will be significant in terms of where the hopefully orderly transition in Egypt will take place," Panetta said. Earlier Thursday, the country's Supreme Military Council met to discuss "necessary measures and preparations to protect the nation," according to the state press agency MENA. TV footage of the meeting showed that it was chaired by Defense Minister Field Marshal Hussein Tantawi and not Mubarak, as is customary. In what the council called "Communique No. 1," read on state television, the military said it would "support the legitimate demands of the people." The council would remain in permanent session to explore "what measures and arrangements could be made to safeguard the nation, its achievements and the ambitions of its great people," the statement said. State TV also reported Thursday that a corruption investigation has been opened against three former Egyptian government ministers and a former ruling party leader. Egyptians have been infuriated by newspaper reports that the Mubarak family has amassed billions, perhaps tens of billions of dollars in wealth while, according to the World Bank, about 40 percent of the country's 80 million people live below or near the poverty line of $2 a day. The family's true net worth is not known. "We demand a trial of Mubarak and his regime; we are protesting corruption," said Mohammed Zarie, one of the marching lawyers, who said hundreds of lawyers arrived from provinces and planned to spend the night at the square. Amid the demonstrations and fresh labor strikes, the government also telegraphed more warnings of a strong response to the popular uprising. Speaking to the Arab news network Al-Arabiya, Foreign Minister Ahmed Aboul Gheit said earlier Thursday that if "adventurers" take over the process of reform, the military "will be compelled to defend the constitution and national security ... and we'll find ourselves in a very grave situation." Gheit's remarks echoed Suleiman's comments a day before implying that martial law could result if the protesters did not go home. NPR's Lourdes Garcia-Navarro said protesters had become increasingly concerned in recent days of a "stealthy crackdown" by soldiers. Until recently, the army has remained neutral, but there have been reports that soldiers have begun harassing protesters in the past few days. "Some of the people that have been trying to get in supplies to the square have disappeared only to re-emerge later with allegations that they have been mistreated by the army," Garcia-Navarro said. 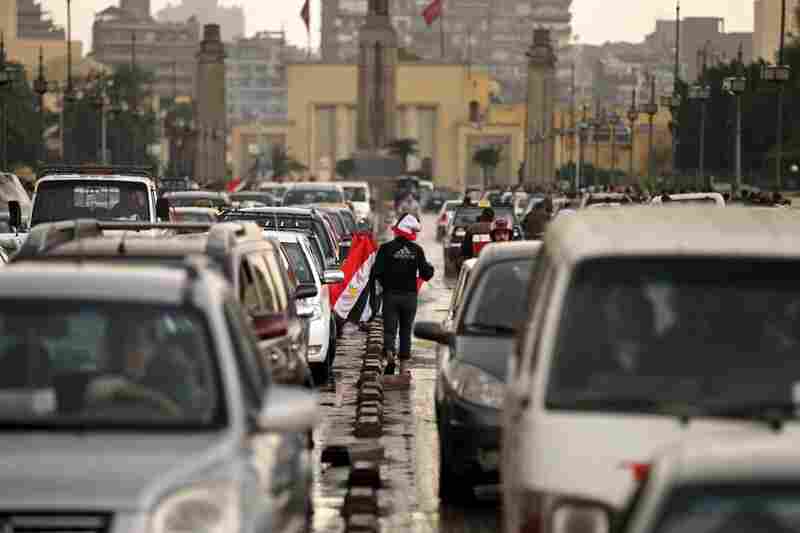 The uncertainty over Mubarak's position left protest organizers' plans for a "march of millions" on Friday in limbo. Youth activists organizing the protests had hoped the turnout at Friday's rally would match demonstrations over the past several weeks that have drawn an estimated quarter-million people or more. NPR's Soraya Sarhaddi Nelson, Lourdes Garcia-Navarro, Corey Flintoff and Eric Westervelt reported from Cairo for this story, which contains material from The Associated Press.